Move over spinach—the greens are here! Beet greens, bok choy, broccoli raab, collard greens, kale, mustard greens, and Swiss chard. Humble and often over-looked, leafy greens are super-nutritious. According to Steven Pratt, MD, coauthor of SuperFoods, dark leafy greens, like their cousin spinach, provide a “synergy of multiple nutrients/phytonutrients” including essential vitamins, minerals, fiber, and omega-3 fatty acids. A bonus: greens are utterly simple to prepare and available year-round. Beet greens—Leafy tops cut from beets have delicate flavor similar to Swiss chard when quickly boiled, steamed, or sautéed. Bok choy—Commonly found with crunchy white stalks and dark green leaves; mildly flavored, eaten raw or cooked; perfectly complemented by Asian seasonings. Broccoli raab—Smaller than regular broccoli, but with more leaves, smaller flowerets, and a gently bitter taste. Collard greens—A type of cabbage with large, flat, paddle-shaped leaves; a traditional “soul food” staple boiled a long time with ham hocks or bacon. Kale—A colorful member of the cabbage family with wrinkled, blue- or purple-tinged leaves; remove tough center stem and prepare like spinach. Mustard greens—Another popular ingredient with a peppery taste and bright green leaves (or many different colors in the Chinese varieties). Swiss chard—A beet family member with dark green wrinkled leaves and reddish (rhubarb chard), pale green, or multicolored stems, with a rich, earthy taste. Easy and fast, stir-frying greens—just long enough to wilt the leaves—is a tasty preparation method. Use one kind or a mixture according to what’s in season. Buy 1 1/2 to 2 (680 to 907 g) pounds to serve four people. Thoroughly wash leaves, discarding any discolored ones, and trim stem ends. Coarsely chop leaves and stems. In a large sauté pan or wok, heat 1 tablespoon (15 ml) olive oil over high heat. Add 2 cloves minced fresh garlic and stir until golden. Add prepared greens and toss to coat with oil, adding a bit more oil if necessary. Sprinkle with salt to taste and continue tossing greens until wilted, 3 to 5 minutes. Serve as a side dish, or use as a bed for grilled fish or chicken. 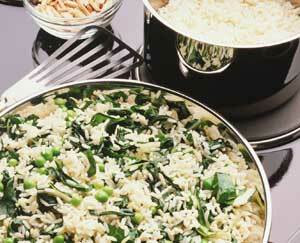 For some other good greens, try Braised Greens with Lots of Garlic, and Penne with Chard, Tomatoes, and White Beans. Judith H. Dern, an independent writer living in Seattle, WA, enjoys the rainbow-colored Swiss chard she finds at her neighborhood farmers market.